vMeasure exp is a flexible measurement software solution that provides you with efficient support in the laboratory, at the test stand, during test drives and endurance tests. With vMeasure exp, you can conveniently record physical values, internal ECU signals as well as signals sent via the vehicle bus. To provide an informative interpretation of the recorded data, the position data (GPS) and video data of the route traveled are also required. Typical tasks of the measurement engineer include measuring OBD signals to ascertain the status of the control unit. With vMeasure exp, you can record all of this data simultaneously and efficiently. In just a few clicks, you create the measurement configuration, set up the measurement windows and get started with the actual measurement tasks. To make it easy to set up the measurement, configuration tools for the hardware of third-party manufacturers, such as CSMconfig by CSM, are integrated in vMeasure exp. For flexible data recording, use the multi-recorder concept with comprehensive trigger options as well as pre-trigger and post-trigger times. Versatile options for visualizing measurement values in real time: graphics window, table, bar chart, numerical display, map, video window, etc. The measured and recorded data can be visualized simultaneously in graphic windows, in the GPS window with saved map material, or in the video window. 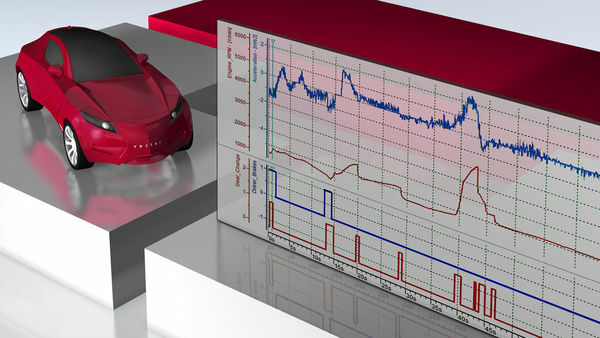 Virtual signals generated during the measurement are also displayed synchronously and can be used for analysis. For the simple and efficient execution of even more complex measurement tasks, you can now use the new software tool vMeasure exp. From the configuration of the measurement setup to measurement data acquisition and graphical evaluation, you receive ideal support from vMeasure during your daily work. Experience with a practical example how easy it is to set up, modify and expand a measurement configuration with vMeasure. And how quickly you are able to access user-friendly visualized measurement data. With scripting and the Equation Editor, learn about the tools for demanding measurement tasks and how you can use them efficiently.